Outline: The importance of being prepared to die; what to do. Truth about what happens at death. Heaven or hell; judgement. God's provision for forgiveness and escaping judgment. 1. Hello, friend. What are you doing? 2. I am preparing my ground for the planting. 1. All of life seems to be spent in preparing for something, doesn't it---preparing the ground, preparing meals, preparing houses-even preparing to die! 2. I had not thought of that. But I do not understand how one can prepare to die, if he is not very sick. 1. Ah, my friend, that is the most important preparing we have to do. Food and clothes will last only a short while. But our spirits will last forever. This life is only the beginning. It is most important that we prepare for the life that comes after we die. 2. Friend, I have often thought of this. How can we know what is true? Some say that death is the end of us. Some say that when we die our spirits are born again in some other form. Some say that we go to another world like this one to live. (Use local beliefs) There are many ides. How can we know the right way? And how can one make any preparations? 1. Yes, many people have these questions. But there is a message from the true God which tells us the truth about these things. Those who have heard His words are very fortunate. 2. Ah, I wish I knew these words from God. Can you tell me? 1. The true God says that our bodies will die, but our spirits will live forever. Those whose sins have been forgiven will go directly to heaven. They will live forever with God. But those whose sins are not forgiven will go to hell, and receive great suffering forever. 2. These are terrible words. Who can get away from his sins? 1. God has provided a way. 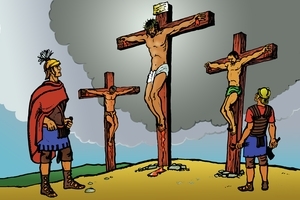 He gave His only Son to take our punishment. Jesus Christ died on the cross in our place. If we believe on Him and obey Him, He will forgive our sins. Then we will not receive the punishment after death. But if we do not obey His words in this life, after death it is too late. There is no other chance. God says, "It is appointed unto man once to die, and after that the judgement." 2. Oh, I am very glad for these words. I did not know the truth before. Now I also will prepare for the future. I will believe on Jesus Christ. And ask Him to forgive my sins. I will obey His words and turn from my evil ways. 1. If you do this, your heart will be filled with happiness and peace. GRN has recorded a version of this script in 239 languages and dialects. See full list.